Situated between the cities of Tarragon and Barcelona, the coastal town of Calafell lies approximately 20Km south west of Sitges. The old part of the town lies 1.5Km inland and has narrow streets with a walled medieval castle on a small hill. Calafell now spreads to the coast where there is a good selection of hotels and restaurants beside the sandy beach which has won blue flag awards in teh past. 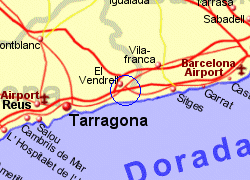 Just to the west and within the Calafel municipality is Segur de Calafell, which has a modern marina. 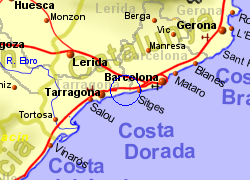 Calafell has a station on the Tarragona to Barcelona railway line giving good acces to these cities. 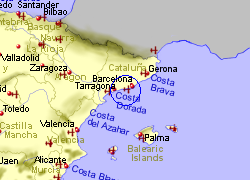 Map of the Calafell area.